There is nothing comparable or remotely fulfilling to one’s soul as to the experiences led of the Holy Spirit of God, through an obedient servant filled with the love of the Father! You will give a joyful cry reading of the victories in this account of the real saving grace of Jesus Christ on the streets in a city named the “City of Angels”. 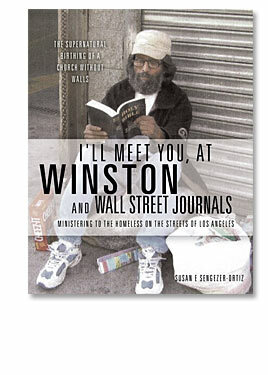 Author Susan E. Sengezer, together with her husband Ronnie, and others of Jesus Cares Ministries, share the love of Christ as a church without walls on the streets of Los Angeles…the “Golden Streets”, formerly known as Skid Row. This is your challenge to open the eyes of your understanding and get out of your own way to bring a soul to Christ today! This book will teach you how, as you take a journey with the ups and downs of street ministry in one of the toughest areas in the United States! After reading this book, you may feel a tug to get out of your pews and take a step into the realization that, when you accepted Jesus Christ as your Lord and Savior, you were already part of a living ministry for Him. Don’t be surprised…God has something for you to do! Susan E Sengezer is co- Pastor of the Little Blessed Chapel Of Jesus Christ .com; a Wedding Ministry that funds Jesus Cares Ministries.US. Susan is a trailblazer for the Lord, blessed with the anointings of Evangelist, Prophetic Seer and one who hears the voice of God.